I was born and grew up in a very small town in the West of Ireland called Castleisland. I am the oldest of four and I have three brothers. My parents are both Primary School teachers. They met when teaching together at a tiny, two-teacher national school called Curranes. My Dad taught in this school until he retired - after 40 years! Some of the children he taught were the grandchildren of his first set of pupils! It’s hardly surprising that I had a keen interest in education and child development from a very early age. I went to Curranes, so my dad was my teacher when I was aged 8,9,10 and 11. I always loved reading. My favourite was Enid Blyton whose books I read over and over. I also loved comics which Dad didn’t approve of and he once he even made a comment about it in my school report! Ireland has a generalist system of education, so in secondary school we studied a wide range of subjects. For my Leaving Certificate (similar to A level) I took exams in English, Irish, French, Chemistry, Biology, Maths & Art History (having dropped the O level Latin, History and Geography). Little did I know how well this wide range would prepare me for working in the wonderful world of Children's publishing. My first proper teaching job was English Teacher at St Aidan’s Community School. At first I taught English to First Years (ages 11 and 12). Then I was asked to take small groups of reluctant readers, disinterested learners and low motivated groups. I had a number of these classes of teenagers aged between 12 and 16 - it was very challenging but very rewarding work. When I returned to read for my MA, I worked as a Tutor at University College Cork, first as a General English Tutor and later as a Specialist Old and Middle English. I got my first job in educational publishing at NFER-Nelson but I quickly moved to Children’s Trade publishing. My first job was at Child’s Play where I learned a tremendous amount. I also did some freelance work for Tamarind at this time and was both inspired and motivated by Verna Wilkins' amazing passion and talent. I went from there to Victoria House / Readers Digest where I saw the best novelty publishing in action under a wonderfully creative MD, Stewart Cowley. After that, I worked at Frances Lincoln before moving on to DeAgostini to start a new children’s list. In 1998, following a buy-out of the DeAgostini, I started Zero to Ten with the very talented Andrew Macmillan from whom I learned everything I know about sales and marketing. It was a tremendous challenge running a small independent list and I learned a fantastic amount. When Zero to Ten was taken over, I was made redundant and I began my freelance career. I now divide my time between working directly with children, writing and publishing. Working with children both informs my work and keeps my feet firmly on the ground and everything else in perspective. I also get to spend at least some of my time on the best job of all - being a fairy! I'm married to my childhood sweetheart and even though he doesn't wear a crown, he's quite a prince. In theory, working for yourself/freelance means you're in charge of your own time and can achieve a satisfying work-life balance. In reality, it means you work all sorts of crazy hours. I still manage to take some time, however. even though so much of my working life is take up with books, I still love to read. I've been addicted to crime novels for many years (I read recently that its only of the only adult genres that has resolution at the end and so is the modern equivalent of Fairy Tales - that's my story and I'm sticking to it!) If you want to see what I (and my friends) are reading, do check out the Goodreads site. I do also make time to watch basketball. I support the closest BBL team to Slough, Guildford Heat, and go to the US if I can about once a year to catch an NBA game. 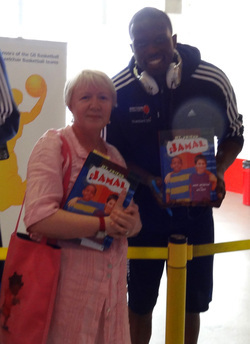 I 'was so excited to meet one of my heros, Luol Deng, and Team GB when they had a warm-up game before the Olympics in 2012 in Sheffield. OK, if you know ball, I realise this is not Luol Deng - it's just a nice picture!